You can find qualifications at all levels on the Learn and Train search. Learning outside of school, such as through youth work awards, is as important as formal learning. Programmes such as the Youth Achievement Awards, Sports Leaders UK Awards and Duke of Edinburgh Leadership Award are all recognised qualifications, as well as programmes owned by the police, fire service and the NHS. Find out more here. The Scottish Qualifications Authority (SQA) accredits and awards most qualifications in Scotland, other than degrees. It also approves organisations which offer qualifications. The SQA works with schools, colleges, universities, industry and the Scottish Government to make sure qualifications are up to scratch. It also issues certificates – it’s the SQA who send the school exam results out. The Scottish Credit and Qualifications Framework (SCQF) helps you understand the main Scottish qualifications offered by schools, colleges, universities and training providers. It also includes learning programmes delivered in the community and in the workplace. How does the Framework help you? You can find an interactive version of the framework on the SCQF website. It helps learners, employers and learning providers understand how different qualifications and learning programmes relate to each other. It can help everyone understand the different routes available to gain new skills and qualifications. Being aware of where your own qualifications sit on the Framework makes it easier to demonstrate the knowledge and skills you have. Qualifications and learning programmes are awarded an SCQF Level and SCQF Credit Points. The SCQF Level gives an idea of the difficulty of the learning programme. SCQF credit points show how much learning has been achieved. You might see SCQF credits on a job advert, and be able to show that your qualifications match the requirements. It can also help you find out where to start if you want to take on new learning or training. For example, with some Advanced Highers or Baccalaureate qualifications, you can enter the second or third year of some degrees. If you’ve studied outside of Scotland, you can use the Framework to show how your qualifications match up to those in Scotland, to make them clearer for employers or learning providers. You can also use the SQA’s Ready Reckoner if you’re planning on studying outside Scotland. 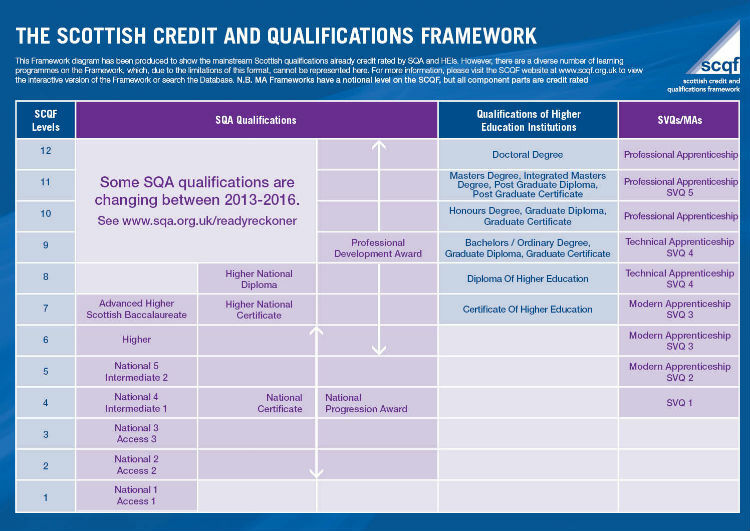 This shows you how the SCQF matches up with the Qualifications Credit Framework (used in England, Wales and Northern Ireland) and the European Qualifications Framework (used in other areas of Europe). The skills and knowledge you pick up through work, family life, community and voluntary activities can be as valuable as formal qualifications. You may also be able to use Recognition of Prior Learning (RPL) to make a claim for SCQF credit points. This helps you show the value of this learning to help you access courses and jobs. The SCQF website gives detailed information about how RPL works. If you left school with few or no qualifications, you can get help to get back to learning The Scottish Wider Access Programme (SWAP) is for adults who have been out of full-time education for at least three years (or five years if you have an NC or Highers). SWAP helps people build on their skills to gain entry level qualifications and move on to college or uni. Most programmes last one year and you’ll get support and guidance while you’re studying. It doesn’t matter how old you are – even if you haven’t studied for years. Visit the SWAP website for more information. Confused about what National 4s and 5s are? Don't worry. Donna Vickers, CfE Support Manager from the SQA, explains what each of the new National Qualifications are, and how they fit in with the Curriculum for Excellence. You can find out more about Nationals at the SQA website. Contact The Big Plus for free, friendly help that suits you. There’s a core set of skills which employers are looking for in young people. But it’s hard to learn them if you don’t have much work experience. That’s where Skills for Work can help. These SQA qualifications are for pupils in third or fourth year of secondary school, and focus on the world of work. You’ll probably spend some time at a college, training provider or an employer and have a chance to learn in a new environment. As well as general skills for work, you’ll also have a chance to find out about different workplaces like construction, hairdressing or hospitality. Learn more about Skills for Work on the SQA website. Could the Certificate of Work Readiness help you? If you don't have the experience you need the Certificate of Work Readiness can help you prepare for work. You'll build the skills, experience and confidence that employers love to see on your CV. The European Computer Driving Licence (ECDL) is for people with little or no previous IT experience. It gives you a good grounding in how to use a computer for work or at home. It is also a helpful qualification for learners with some knowledge of IT to increase their skills and show employers that they have a good working knowledge of computers. Visit the ECDL website for more information. If English isn’t your first language and you want to improve your verbal and written skills, an English for Speakers of Other Languages (ESOL) course could help. ESOL is the most common course for people learning English and can be taken in many learning centres and colleges. You can use the Learn and train search to find ESOL courses.